Stamford AFC are out to recover lost pride when they host Northwich Victoria in Division One South of the Evo Stik Northern Premier Division tonight (March 21). Daniels boss Graham Drury accused his players of ‘appearing to give up’ in the latter stages of Saturday’s (March 18) 5-0 home defeat at the hands of Stocksbridge Park Steels. On the face of it, tonight is an ideal opportunity to save face as visitors Northwich Victoria are bottom of the table. Wisbech Town chase a sixth straight United Counties Premier Division win at Eynebsury tonight. 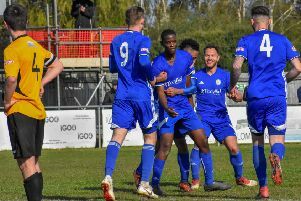 The Fenman made it five in a row with a 2-0 home win over Harborough Town on Saturday which featured a second goal of the season for goalkeeper Sam Vince from the penalty spot. It will be tough for Wisbech tonight as Eynesbury are two places ahead of them in fifth.